Kona Diary 2016 Part 6. Taper. The Fragility of Big Ideas. Every other photo has been from a past race. Looking backwards. Now, I’m looking forward to this one. From an evening run in the Natural Energy Lab. Taper. Week 2 Recap. Week 1 Preview. The Fragility of Big Ideas. Well, I made it. It always feel like more of an accomplishment than perhaps it should, arriving at the start of taper in some form that still resembles what I think of as “myself.” When things go well, there’s no particular sense of crossing some momentous threshold; it’s more seamless. When things are not going well, and I’ve certainly had my share of experience in this regard, taper arrives with an overwhelming sense of relief, as you feel the weight of no longer having to train more lifted from your shoulders. A good start to taper is a sense of mental readiness but physical fatigue. A bad taper starts with a tremendous sense of mental fatigue. As I write this on the flight from LAX to KOA, I would say, mostly, I am nervous. Nervousness requires mental acuity. A sense not only how I might fail, but also how I might succeed. Nervousness is not anxiety. Nervousness comes out of a sense of opportunity. Nervous is good. You are supposed to be nervous before racing in Kona. For much of the last week, my mind has been increasingly captivated by something other than training and the prospect of racing. Like many folks – a record 80 million, I tuned into the US presidential debate on Monday night. I am sure that regular readers of what I write will not be the least bit surprised to learn that, as an avowed liberal with a somewhat socialist bent, I am going to vote Democratic. I do not do so eagerly, as I hold – like much of the country seems to based on polling – a relatively dim view of both candidates. As many folks of lamented, there are a lot of problems this election cycle, but perhaps the biggest one is that we have a choice between the two least popular candidates of all time. The point of this post is not to delve into politics, but rather to use it as entré to discuss the idea of fragility. Not physical fragility, but the fragility of ideas. George Saunders wrote an excellent piece – at least if you happen to like George Saunders, which I do – for the New Yorker in July about “Who Are All These Trump Supporters.” It’s a fascinating snapshot of America at a massively important time in our history. Lots has been written about just how seminal this upcoming election is, but I do not have either the hindsight or the foresight to judge the relative truth of these statements. I think few people realized how important the Bush v. Gore election was in 2000, and yet it seems possible in many ways that the outcome of that election collided with history to produce a more landmark event – in hindsight – than I certainly realized at the time of the first election in which I took part. Only with hindsight did we realize the impact. But this time, the import is staring us in the face. To borrow Saunder’s phrasing, Trump has made it clear that the idea of America – whatever that may mean to you, and it clearly means a lot of different things to a lot of different people – is something that may not survive my lifetime. I had never really considered that before. What’s especially clear about this election is that lots of people share this exact same view, but for – in many cases – diametrically opposed reasons. But I imagine it that way now. This idea resonated especially powerfully with me during the final part of my training. I joked to my coach before IRONMAN Texas that I had reached the “existential crisis” phase of IRONMAN training, though at that time, I remember more feelings of “what does this – training and racing – really mean? Why do I do this?” This time around during the final push in training, I felt a deep connection with the idea of significance of opportunity and of momentous ideas. I was not just preparing for another race. There’s a challenge here – balancing the importance of a race like Kona that is different but also not allowing that to overwhelm you such that you deviate from proper process. You are never guaranteed another shot at Kona. Each chance represents a singular opportunity. And needs to be treated as such. Kona is just another race, but it is also not. It is a special and rare and – ultimately – fragile opportunity. And – I really promise this is not about politics – this idea continued to rattle around in my head during training because I see similar fragility of ideas that I once thought incredibly robust – in a disturbing number of other areas of my life that are important to me. I came close to losing my best friend over a disagreement regarding politics. What saved it? I am not sure. I suspect that we largely salvaged it by a realization that, on balance, we liked each other more than we did not. There’s a big part of this that feels like a cop out to principle, but as Saunder’s discusses, there’s a big difference in what people believe in general and when it comes down to specific, individual, real people. It’s easy to want to, “deport the illegals.” It’s quite different to ask someone, for example, “okay, so you want to remove this person here, who was brought here by her parents as a baby, from the only country she’s ever known as a home?” That’s the sort of discussion that, in most people, actually requires you to think really, really hard about what you actually believe. For reasons that I won’t get into only because I value my wife’s privacy, this – the loss of my best friend – hit even harder because I had earlier this summer for the very first time seen the prospect of the dissolution of my marriage writ large and real before me in a way that I had never imagined. While 50% of marriages end in divorce, I never actually thought that would happen to me until I saw precisely how it could. Marriages and friendship – like national identities – are actually remarkably fragile, and require a vigilance and lots and lots of compromise to keep them in tact. But how much compromise is too much? That question is being tested to a remarkable degree right now in the sporting world. The Russian doping scandal rocked the sports world before the Olympics, but it has been the subsequent chain of other events that enjoyed a place in the spotlight they might not have otherwise had without the Russian debacle that has really made me – and many others – wonder, “What is exactly is the value of ‘sport’?” Sport – like America – is an idea that means something different to almost everyone and where, certainly, the reality is much uglier than the ideal. But nevertheless, until recently, I held firm to the idea that sport – as an idea – was not something that would expire as I know it in my lifetime. While the Olympics is not representative of all sport, it certainly is emblematic of it, and the overwhelming failures at virtually every level of bureaucratic infrastructure is staggering. The Fancy Bears leaks, in particular, have made me really wonder if sport is all just a farce. How do I reconcile this as I head to a major championship sporting event? It’s hard. A certain amount of fatalism makes things much easier, but it grates against the idea of principle. I remember when the Associated Press broke the story about the water quality – or lack thereof – in many of the Rio venues, including the triathlon. My coach, Joel Filliol, who had (I believe) nine athletes competing in Rio took the basic position of, “Well, it’s out of [my and my athletes’] hands. We can’t not race.” Which, of course, was not really true. Of course you can not race. But, can you really? Where does that leave you after the 15min of adulation and support for being so brave fades away? What do you when the things that you believe in – such as your (or your athletes’) health and the chance to test yourself on the biggest stage in sports – seem to stand in opposition to each other? Much was made of the golfers who chose to opt out of Rio because of Zika, and the most powerful criticisms were, “Of course. It’s easy for them. They don’t have to compete.” The real difference, of course, wasn’t the choice (or lack thereof). It was the cost of that choice. For many years, I avoided the race in Kona largely out of a similar dynamic. The idea that you had to do Kona did not sit well with me. I was younger – and more contrarian, and I think I did not do Kona in large part because “everyone” told me I had to. Clearly you don’t have to, and yet – to a certain extent – you do. Kona is the pinnacle for long distance triathlon. If you claim to you want to be the best in the world – which I did and do – you have to test yourself against the best in the world. But I didn’t like that, somehow, IRONMAN was in control of me. I’m an independent thinker dammit! I remember a piece that I wrote for Slowtwitch that Dan agreed to publish that, in retrospect, I’m surprised he didn’t chide me for. It started as a response to a question posed in the forum after I won IRONMAN Canada in 2011. In it, I basically challenged the idea that “IRONMAN” (and it’s corporate parent WTC) was a “steward” within our sport. I wrote it in much the same way that I see seemingly thoughtful people asking absurd questions like, “do you believe in the government controlling everything?” I felt very justified and very righteous. And yet I was incredibly stupid and naive. The blowback from my article came in the form of my longtime friend and mentor at WTC, Paula Newby-Fraser. Paula taught me the lesson that I think – or hope – is an inherent part of growing up. And that is that organizations are made up of people. Who exactly did I think was not a “steward” of the sport? Was it the folks dropping cones on the highway at 4am? The folks zip tie-ing barricades around transition? Who was I indicting? Oh… I wasn’t indicting anyone in particular. Except I was. I was indicting all of them. Specifically. And I was absolving myself of responsibility in the process. I talked in that article about how I wanted to leave the sport better than I found it. But by doing what? A year later, I was given a chance to do actually that. I started as an IRONMAN pro ambassador in 2013 – a role I’ve filled since then, and I’m proud of what I have been able to contribute. And especially for what I’ve learned. Obama wrote in his memoir that, while campaigning and – necessarily – interacting with major political donors, his views came increasingly to resemble theirs. To many progressives, this seemed like the ultimate sin. He was selling out! And he was admitting to it! And yet I have seen this in myself. During my time working with/for Ironman, I’ve been incredibly lucky to have seen a lot of the fundamentals of how that organization which I roundly criticized actually works. To see, firsthand, a lot of the tough decisions that have to be made. And my big realization is that idealism is easy. It is, however, also very necessary. But you have to reconcile idealism with pragmatism. And that is hard. Just staking out the idealist stance is the cop out. That is selling out. I like Andrew Messick a great deal. I also think he’s doing a great job at the helm of IRONMAN. The more I come to know Andrew and the more I work with him, the better I like him. And the better job I think he is doing. Is there some bias in that? Of course. But I also think that I’m privileged to see the challenges he wrestles with. And I would say that this same sense applies to everyone that I see that works with Andrew. IRONMAN puts on great races. I know from Andrew that there is a checklist for every race that has roughly 1,800 items on it. If any one of those boxes is not checked, it will impact someone’s perception of the race. And you will definitely hear about that one thing on social media. But what you won’t hear about it the incredibly long list of things that had to be done correctly and which were done correctly. I used to focus on the boxes that didn’t get checked. Now I try to focus on the ones that do. As an idealist, I was greatly let down by Obama’s time in office. But Dan Empfield takes a more circumspect view. He thinks Obama has done a great job. He’s faced enormous obstacles in the form of an obstructionist Congress and has done the best job he could in spite of those obstacles. I tend to agree with this statement, though I’ve heard rational – though I believe incorrect – arguments to the contrary. The truth (or falsehood) of this statement is not particularly important for the purpose of this essay. The second part of Dan’s more in-depth answer is that just because of he approves – as a whole – of the job Obama has done, that does not mean he approves of everything that Obama has done. One of his most eloquent articles expounding on this idea came on the topic of Lance Armstrong. It was entitled, “The Entire Lance Armstrong.” And basically, it exhorted us to consider Lance as a complete human being, one with numerous and major flaws, but also one with a lot of virtues. The same is true of anything of value – friendship, marriage, sport, government. They have flaws. But they have a lot more virtues. And, most often, we pay attention to the flaws while simply taking the virtues for granted. I see this as the remedy to fatalism. Fatalism absolves you of responsibility. I don’t exactly know what to call this approach. Pragmatism? That seems rather crude. And also incomplete. Being an adult? I guess that works. I think it comes down to recognizing that many of the ideas we hold very dear are actually much more fragile than we’d like to admit. And that it’s up to each of us to judge whether or not the flaws outweigh the virtues. That requires acknowledging those flaws, not denying them. This is especially hard now because much of how we process information has been increasingly shrunk down into soundbites, tweets, and wholly incomplete pictures of the way things are. People seize on the part that’s relevant to them. Life has become an expanded version of the scene in “Meet the Parents” after Ben Stiller gets chucked off the airplane. I will head to race in Kona recognizing that this race – and my participation in it – is not without its flaws. The hard part is how do you talk about those things in such a way so as to make the thing you love stronger rather than to break it? In my personal life, I’ve often defaulted to the stance of not talking about something. The idea that somehow putting something into words would make it real in a way that it was not before. And I find myself in the same position here. 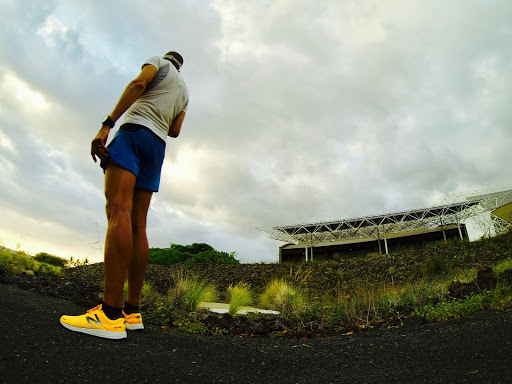 I had begun to list some of what I see as the flaws of the race in Kona, but I stopped. I deleted it. Why? Because I just didn’t see that it would achieve anything. To a certain extent, that’s because this is an essay, not a discussion. I don’t have the chance in real time to clarify or to say, “Wait! that’s not what I meant.” It’s easy to see cowardice – to see flaws – in the idea that, “Discretion is the better part of valor.” But there’s a lot of virtue in it as well. I cannot control what part of this essay is snapshotted and tweeted out, without the context I intended. Like the pre-race checklist, it’s the one flaw, not the 1,799 virtues that will be keyed on. As I said to my friend Brandon Marsh, with whom I have a refreshing number of candid discussions about these sorts of things, “As I get older, I find myself pushing DELETE rather than POST with increasing frequency.” The best part of Saunder’s essay covers this most eloquently. I hope you all read the whole thing, but I will quote Saunder’s directly here. This, Mr. Trump, I thought, is why we practice civility. This why, before we say exactly what is on our mind, we run it past ourselves, to see if it makes sense, is true, is fair, has a flavor of kindness, and won’t hurt someone or make someone’s difficult life more difficult. Because there are, among us, in every political camp, limited, angry, violent, and/or damaged people waiting for any excuse to throw off the tethers of restraint and get after it. After which it falls to the rest of us, right and left, to clean up the mess. As concrete and permanent as these things may seem now, their beginnings all reveal their common fragility. These ideas require stewardship. These ideas require civility. These ideas require compromise. In the bombastic and scattered collection of disparate ideas that seems to encapsulate Trump’s platform, there is something for almost everyone to dislike. There is also something for almost everyone to like. A great many of the conversations that Trump has forced into the spotlight are things that I feel we need to discuss. But what of the way in which we discuss them? Wait, what? Is protest not at the heart of Trump’s campaign? Is protest not the very foundation of it? A lot of very weak essays have been written that acknowledge the validity of Kaepernick’s protest and his personal right to protest, but which object to the method by which he does it. One of the most roundly criticized was David Brooks’ essay which argued, essentially, that Kaepernick’s protest was bad for national unity. And in truth, it was hard to not initially read Brooks essay as incredibly condescending. Sitting out the anthem takes place in the context of looming post-nationalism. When we sing the national anthem, we’re not commenting on the state of America. We’re fortifying our foundational creed. We’re expressing gratitude for our ancestors and what they left us. We’re expressing commitment to the nation’s ideals, which we have not yet fulfilled.If we don’t transmit that creed through shared displays of reverence we will have lost the idea system that has always motivated reform. We will lose the sense that we’re all in this together. We’ll lose the sense of shared loyalty to ideas bigger and more transcendent than our own short lives. By repeatedly standing and pledging allegiance to something larger than ourselves, that act – in some small way – actually makes that thing become real. The counter to this came in the form of a very good article on TheUndefeated.com that basically argues the opposite – that the very idea of America is rooted in protest. America itself was founded as a protest. This is what a stand looks like. For better or worse, stands that demand people come together rarely have that effect. And contrary to popular belief, stands do not create divisions and fissures. They amplify them. The whole point of a stand is to put them on display, to ask the world to confront and examine their hypocrisies and ask why they’re on one side and not the other. Protests that don’t offend aren’t worth the effort. The ones that do are the ones that can change the world. The idea that all men are created equal is incredibly unifying but it’s also a massive protest against, well, pretty much everything in human society. Perhaps even in our DNA (the idea of an alpha male and/or alpha female in primates certainly does not support the idea that we are all created equal). Ultimately, I think the truth is that they are both right. And therein lies the fragility that seems so inherent in anything of value. The things that make something special are also, very often, the same things that would tear it apart. IRONMAN is the ultimate solitary endeavor. And yet what makes it special is that it is a shared experience. Dan Empfield has written about triathlon that one of its somewhat uniquely defining characteristics is that it requires participation. Runners can – and do – self-identify as runners simply because they run. Cyclists because they bike. Swimmers because they swim. While lapses – sometimes very long lapses – occur, triathletes necessarily define themselves by competition. In order to be a triathlete, you must race. You must compete. This might be Kona, or it might be a local race, or even just a semi-organized outing with friends such as my best friend Mark’s “Beerman” which takes place over an unmarked course and with unspecified and highly flexible “rules,” but it requires more than just doing a bunch of swimming and also biking and also running in isolation, meaning both isolated from other people and isolated from the successive nature of events (not necessarily swim then bike then run, but that there is a sense that it is a single event rather than disparate ones; triathlon is one sport, not three). Just as you must balance pacing across three sports, the race as a whole must balance the needs and wants of many. In my last post, I talked about the idea of anti-fragility. The idea of becoming stronger in the face of shocks and uncertainty. I think that’s incredibly important because “systems” – profound ideas and relationships are both systems (def: “a set of connected things or parts forming a complex whole”) – are inherently fragile. The only way that they survive is because of antifragility on the parts of those who steward them. In the face of uncertainty, you commit to working harder, to finding solutions, to compromise, to not letting the perfect be an obstacle to the good, and to pushing back against those who would undermine those efforts. IRONMAN motto is “Anything Is Possible.” That is not just an opportunity. It is a responsibility. On all our parts. ← Kona Diary 2016 Part 5. Week 3 Update. The Anti-Fragile Athlete.